Novelist Annabel Lyon (The Golden Mean) is the fourth annual writer in residence at UBC's Okanagan campus. Lyon will spend two weeks on campus from Mar. 6 to 20, 2011. 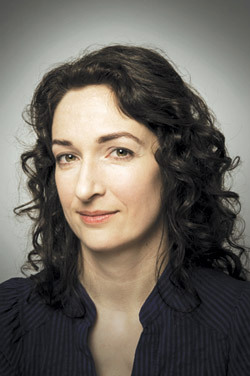 Lyon is the author of Oxygen (stories, 2007), The Best Thing for You (novella, 2004), All-Season Edie (juvenile novel, 2007) and The Golden Mean (novel 2009) which was nominated for the Scotiabank Giller Prize and the Governor General’s Award in 2009, and won the 2009 Rogers Writers Trust Award. The unique and popular Writer in Residence program allows 16 selected local writers to get free critiques of their work. Writers are invited to have their work critiqued and to participate in a one-on-one meeting with Lyon. Appointments are limited to 16, with six of the 16 spaces reserved for students from UBC's Okanagan campus. To be considered for an appointment, send a maximum of 15 double-spaced pages of your fiction (plus a one-page synopsis if it is an excerpt from a longer work). Submissions should be sent via email to irma.ronkkonen@ubc.ca, between Jan. 12 and Jan. 31. In the email provide your name, student number (if applicable), phone number, and email address, with "Writer in Residence" in the subject line. In addition to meeting with local writers, Lyon will give a free public reading and will meet with various classes at the university. The public reading is at the downtown Kelowna branch of the Okanagan Regional Library on Thursday, March 10 at 7 p.m.
Lyon will also teach a Continuing Studies workshop on March 12. To enrol in the workshop offered through Continuing Studies phone 250-807-9289.